New Delhi: A psychiatrist who works for the mentally-ill street persons in Mumbai, has been declared as one of the winners of this year’s Ramon Magsaysay Award, which is regarded as the Asian version of the Nobel Prize. 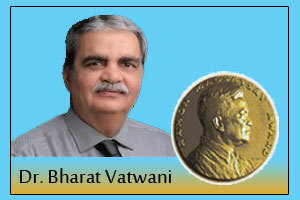 Dr Bharat Vatwani, a psychiatrist by profession, is being recognised for “his tremendous courage and healing compassion in embracing India’s mentally-afflicted destitute, and his steadfast and magnanimous dedication to the work of restoring and affirming the human dignity of even the most ostracized,” the Ramon Magsaysay Award Foundation said in its citation for the winner. Vatwani successfully completed his medical studies in psychiatry at Grant Medical College and at G.S. Medical College & Hospital, both in Mumbai. Dr. Vatwani and his wife started an informal operation of bringing mentally-ill street persons to their private clinic for treatment, leading them to establish Shraddha Rehabilitation Foundation in 1988, aimed at rescuing mentally-ill persons living on the streets; providing free shelter, food, and psychiatric treatment; and reuniting them with their families. Their rescue work has been aided by the police, social workers, and referrals. Shraddha’s free custodial care and treatment ranges from personal hygiene, medical check-ups, psychiatric treatment, to appropriate medication—all done in the open, healing environment of the Karjat facility. What inspired the doctor to build this foundation? Dr Vatwani once saw a young man ‘with unkempt long hair who was drinking dirty water from the roadside gutter’. The sight moved him and from that moment on, he decided to take care of the young man and other people like him. “After treating the boy, I was shocked to learn of his identity. He was a BSc graduate with a diploma in medical laboratory technology and his father was a superintendent in Andhra Pradesh,” recalls Dr Vatwani. Thereafter, he helped the young man, who was suffering from schizophrenia to reunite with his family and since then he has reached out to innumerable such people. “Most of the destitute were from UP, Maharashtra, Karnataka, MP, West Bengal, Gujarat, Bihar, Andhra Pradesh and Tamil Nadu. Six people were reconnected with their family in Nepal,” Dr Vatwani said in an interview to The Indian Express. After their encounter with the man who drank water from a canal, Dr. Vatwani and his wife started an informal operation of bringing mentally-ill street persons to their private clinic for treatment. This eventually led to the establishment of Shraddha Rehabilitation Foundation in 1988, aimed at rescuing mentally-ill persons living on the streets; providing free shelter, food, and psychiatric treatment; and reuniting them with their families. Starting with a two-room tenement that could take only three people at a time, Shraddha drew public attention when they rescued and treated a street person who turned out to be a respected lecturer at a Mumbai art school, who had inexplicably disappeared. Learning about what the Vatwanis had done, the school’s faculty and students organized a major art exhibition that drew 141 participating artists in India and abroad, and successfully raised US$22,357. Using this seed money, the Vatwanis bought a piece of property in Mumbai for a 20-bed facility that they opened in 1997; the unexpected donation inspired them to further expand their work with the help of private donors, volunteer professionals, and social workers. In 2006, they moved to a bigger 120-patient facility in Karjat outside Mumbai, which had five buildings on a 6.5-acre land. By then, they had strengthened their three-phase therapeutic program, consisting of the rescue and treatment of mentally-ill street persons, reuniting patients with their families, and promoting awareness of mental health in communities. Their rescue work has been aided by the police, social workers, and referrals. Shraddha’s free custodial care and treatment ranges from personal hygiene, medical check-ups, psychiatric treatment, to appropriate medication—all done in the open, healing environment of the Karjat facility where patients can engage in simple farm activities and find solace in a multi-religious meditation center. The foundation tracks patients’ families, arranges reunions, and uses such opportunities to spread a supportive and enlightened understanding of mental health among the families and their communities. In a one-of-a-kind mission that began in 1988, Vatwani and the foundation have by now rescued, treated, and reintegrated into their families and communities more than 7,000 of India’s mentally-ill roadside destitute, with a remarkable reunion rate of 95%. Salutations to the comitted couple for their passion in their profession and making others lives better after bitter experiences.Many lives are lost when there is no way ,care and solace.No proper diagnosis and follow up medical care due to ignorance.You are really blessed to be able to do this noble service Sir.Hearty congratulations. It is indeed a great pride to know that dr vatwani has been awarded Magsaysay AWARD.